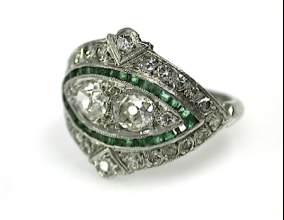 One platinum art deco ring. Two old Mine cut diamonds (0.71 carats: VS-SI1 clarity: I-J colour). Twenty-four single cut diamonds (0.45 carats: VS-SI1 clarity: I-J colour). Thirty straight baguette cut emeralds (0.80 carats).